Inherited by QAbstractListModel, QAbstractProxyModel, QAbstractTableModel, QDirModel, QFileSystemModel, QHelpContentModel, QProxyModel, and QStandardItemModel. The QAbstractItemModel class provides the abstract interface for item model classes. The QAbstractItemModel class defines the standard interface that item models must use to be able to interoperate with other components in the model/view architecture. It is not supposed to be instantiated directly. Instead, you should subclass it to create new models. The QAbstractItemModel class is one of the Model/View Classes and is part of Qt's model/view framework. If you need a model to use with a QListView or a QTableView, you should consider subclassing QAbstractListModel or QAbstractTableModel instead of this class. The underlying data model is exposed to views and delegates as a hierarchy of tables. If you don't make use of the hierarchy, then the model is a simple table of rows and columns. Each item has a unique index specified by a QModelIndex. Every item of data that can be accessed via a model has an associated model index that is obtained using the index() function. Each index may have a sibling() index; child items have a parent() index. Each item has a number of data elements associated with it, and each of these can be retrieved by specifying a role (see Qt::ItemDataRole) to the model's data() function. Data for all available roles can be obtained at the same time using the itemData() function. Data for each role is set using a particular Qt::ItemDataRole. Data for individual roles are set individually with setData(), or they can be set for all roles with setItemData(). Items can be queried with flags() (see Qt::ItemFlag) to see if they can be selected, dragged, or manipulated in other ways. If an item has child objects, hasChildren() returns true for the corresponding index. 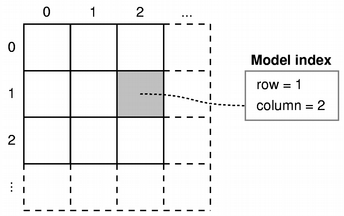 The model has a rowCount() and a columnCount() for each level of the hierarchy. Rows and columns can be inserted and removed with insertRows(), insertColumns(), removeRows(), and removeColumns(). The model emits signals to indicate changes. For example, dataChanged() is emitted whenever items of data made available by the model are changed. Changes to the headers supplied by the model cause headerDataChanged() to be emitted. If the structure of the underlying data changes, the model can emit layoutChanged() to indicate to any attached views that they should redisplay any items shown, taking the new structure into account. The items available through the model can be searched for particular data using the match() function. If the model is sortable, it can be sorted with sort(). Note: Some general guidelines for subclassing models are available in the Model Subclassing Reference. When subclassing QAbstractItemModel, at the very least you must implement index(), parent(), rowCount(), columnCount(), and data(). These functions are used in all read-only models, and form the basis of editable models. You can also reimplement hasChildren() to provide special behavior for models where the implementation of rowCount() is expensive. This makes it possible for models to restrict the amount of data requested by views, and can be used as a way to implement lazy population of model data. To enable editing in your model, you must also implement setData(), and reimplement flags() to ensure that ItemIsEditable is returned. You can also reimplement headerData() and setHeaderData() to control the way the headers for your model are presented. Note that the dataChanged() and headerDataChanged() signals must be emitted explicitly when reimplementing the setData() and setHeaderData() functions, respectively. Custom models need to create model indexes for other components to use. To do this, call createIndex() with suitable row and column numbers for the item, and an identifier for it, either as a pointer or as an integer value. The combination of these values must be unique for each item. Custom models typically use these unique identifiers in other reimplemented functions to retrieve item data and access information about the item's parents and children. See the Simple Tree Model example for more information about unique identifiers. It is not necessary to support every role defined in Qt::ItemDataRole. Depending on the type of data contained within a model, it may only be useful to implement the data() function to return valid information for some of the more common roles. Most models provide at least a textual representation of item data for the Qt::DisplayRole, and well-behaved models should also provide valid information for the Qt::ToolTipRole and Qt::WhatsThisRole. Supporting these roles enables models to be used with standard Qt views. However, for some models that handle highly-specialized data, it may be appropriate to provide data only for user-defined roles. An insertRows() implementation must call beginInsertRows() before inserting new rows into the data structure, and it must call endInsertRows() immediately afterwards. An insertColumns() implementation must call beginInsertColumns() before inserting new columns into the data structure, and it must call endInsertColumns() immediately afterwards. A removeRows() implementation must call beginRemoveRows() before the rows are removed from the data structure, and it must call endRemoveRows() immediately afterwards. A removeColumns() implementation must call beginRemoveColumns() before the columns are removed from the data structure, and it must call endRemoveColumns() immediately afterwards. The private signals that these functions emit give attached components the chance to take action before any data becomes unavailable. The encapsulation of the insert and remove operations with these begin and end functions also enables the model to manage persistent model indexes correctly. If you want selections to be handled properly, you must ensure that you call these functions. If you insert or remove an item with child items, you don't need to call these functions for the child items. See also Model Classes, Model Subclassing Reference, QModelIndex, QAbstractItemView, Using Drag and Drop with Item Views, Simple DOM Model Example, and Simple Tree Model Example. Constructs an abstract item model with the given parent. Destroys the abstract item model. Begins a column insertion operation. When reimplementing insertColumns() in a subclass, you must call this function before inserting data into the model's underlying data store. The parent index corresponds to the parent into which the new columns are inserted; first and last are the column numbers of the new columns will have after they have been inserted. Specify the first and last column numbers for the span of columns you want to insert into an item in a model. This inserts the three new columns as columns 4, 5, and 6. To append columns, insert them after the last column. This appends the two new columns as columns 6, 7, and 8. Begins a row insertion operation. When reimplementing insertRows() in a subclass, you must call this function before inserting data into the model's underlying data store. The parent index corresponds to the parent into which the new rows are inserted; first and last are the row numbers that the new rows will have after they have been inserted. Specify the first and last row numbers for the span of rows you want to insert into an item in a model. This inserts the three new rows as rows 2, 3, and 4. To append rows, insert them after the last row. This appends the two new rows as rows 4 and 5. Begins a column removal operation. When reimplementing removeColumns() in a subclass, you must call this function before removing data from the model's underlying data store. The parent index corresponds to the parent from which the new columns are removed; first and last are the column numbers of the first and last columns to be removed. Specify the first and last column numbers for the span of columns you want to remove from an item in a model. Begins a row removal operation. When reimplementing removeRows() in a subclass, you must call this function before removing data from the model's underlying data store. The parent index corresponds to the parent from which the new rows are removed; first and last are the row numbers of the rows to be removed. Specify the first and last row numbers for the span of rows you want to remove from an item in a model. Returns a model index for the buddy of the item represented by index. When the user wants to edit an item, the view will call this function to check whether another item in the model should be edited instead, and construct a delegate using the model index returned by the buddy item. In the default implementation each item is its own buddy. Returns true if there is more data available for parent, otherwise false. The default implementation always returns false. Changes the QPersistentModelIndex that is equal to the given from model index to the given to model index. If no persistent model index equal to the given from model index was found, nothing is changed. See also persistentIndexList() and changePersistentIndexList(). Changes the QPersistentModelIndexes that is equal to the indexes in the given from model index list to the given to model index list. If no persistent model indexes equal to the indexes in the given from model index list was found, nothing is changed. See also persistentIndexList() and changePersistentIndex(). Returns the number of columns for the children of the given parent. Tip: When implementing a table based model, columnCount() should return 0 when the parent is valid. This signal is emitted just before columns are inserted into the model. The new items will be positioned between start and end inclusive, under the given parent item. Note: Components connected to this signal use it to adapt to changes in the model's dimensions. It can only be emitted by the QAbstractItemModel implementation, and cannot be explicitly emitted in subclass code. See also insertColumns() and beginInsertColumns(). This signal is emitted just before columns are removed from the model. The items to be removed are those between start and end inclusive, under the given parent item. See also removeColumns() and beginRemoveColumns(). This signal is emitted after columns have been inserted into the model. The new items are those between start and end inclusive, under the given parent item. This signal is emitted after columns have been removed from the model. The removed items are those between start and end inclusive, under the given parent item. Creates a model index for the given row and column with the internal pointer ptr. Note that when you are using a QSortFilterProxyModel its indexes have their own internal pointer. It is not advisable to access the internal pointer in the index outside of the model. Use the data() function instead. This function provides a consistent interface that model subclasses must use to create model indexes. Creates a model index for the given row and column with the internal identifier, id. Returns the data stored under the given role for the item referred to by the index. Note: If you do not have a value to return, return an empty QVariant() instead of returning 0. See also Qt::ItemDataRole, setData(), and headerData(). This signal is emitted whenever the data in an existing item changes. The affected items are those between topLeft and bottomRight inclusive (of the same parent). Note that this signal must be emitted explicitly when reimplementing the setData() function. See also headerDataChanged(), setData(), and layoutChanged(). Handles the data supplied by a drag and drop operation that ended with the given action. Returns true if the data and action can be handled by the model; otherwise returns false. Although the specified row, column and parent indicate the location of an item in the model where the operation ended, it is the responsibility of the view to provide a suitable location for where the data should be inserted. For instance, a drop action on an item in a QTreeView can result in new items either being inserted as children of the item specified by row, column, and parent, or as siblings of the item. When row and column are -1 it means that it is up to the model to decide where to place the data. This can occur in a tree when data is dropped on a parent. Models will usually append the data to the parent in this case. Returns true if the dropping was successful otherwise false. See also supportedDropActions() and Using Drag and Drop with Item Views. Ends a column insertion operation. When reimplementing insertColumns() in a subclass, you must call this function after inserting data into the model's underlying data store. Ends a row insertion operation. When reimplementing insertRows() in a subclass, you must call this function after inserting data into the model's underlying data store. Ends a column removal operation. When reimplementing removeColumns() in a subclass, you must call this function after removing data from the model's underlying data store. Ends a row removal operation. When reimplementing removeRows() in a subclass, you must call this function after removing data from the model's underlying data store. Fetches any available data for the items with the parent specified by the parent index. Reimplement this if you have incremental data. The default implementation does nothing. Returns the item flags for the given index. The base class implementation returns a combination of flags that enables the item (ItemIsEnabled) and allows it to be selected (ItemIsSelectable). Returns true if parent has any children; otherwise returns false. Use rowCount() on the parent to find out the number of children. See also parent() and index(). Returns true if the model returns a valid QModelIndex for row and column with parent, otherwise returns false. Returns the data for the given role and section in the header with the specified orientation. For horizontal headers, the section number corresponds to the column number of items shown beneath it. For vertical headers, the section number typically to the row number of items shown alongside it. See also Qt::ItemDataRole, setHeaderData(), and QHeaderView. This signal is emitted whenever a header is changed. The orientation indicates whether the horizontal or vertical header has changed. The sections in the header from the first to the last need to be updated. Note that this signal must be emitted explicitly when reimplementing the setHeaderData() function. If you are changing the number of columns or rows you don't need to emit this signal, but use the begin/end functions (see the section on subclassing in the QAbstractItemModel class description for details). See also headerData(), setHeaderData(), and dataChanged(). Returns the index of the item in the model specified by the given row, column and parent index. When reimplementing this function in a subclass, call createIndex() to generate model indexes that other components can use to refer to items in your model. On models that support this, inserts count new columns into the model before the given column. The items in each new column will be children of the item represented by the parent model index. If column is 0, the columns are prepended to any existing columns. If column is columnCount(), the columns are appended to any existing columns. If parent has no children, a single row with count columns is inserted. Returns true if the columns were successfully inserted; otherwise returns false. The base class implementation does nothing and returns false. If you implement your own model, you can reimplement this function if you want to support insertions. Alternatively, you can provide you own API for altering the data. See also insertRows(), removeColumns(), beginInsertColumns(), and endInsertColumns(). On models that support this, inserts count rows into the model before the given row. The items in the new row will be children of the item represented by the parent model index. If row is 0, the rows are prepended to any existing rows in the parent. If row is rowCount(), the rows are appended to any existing rows in the parent. If parent has no children, a single column with count rows is inserted. Returns true if the rows were successfully inserted; otherwise returns false. See also insertColumns(), removeRows(), beginInsertRows(), and endInsertRows(). Returns a map with values for all predefined roles in the model for the item at the given index. Reimplemented this function if you want to extend the default behavior of this function to include custom roles in the map. See also setItemData(), Qt::ItemDataRole, and data(). This signal is emitted just before the layout of a model is changed. Components connected to this signal use it to adapt to changes in the model's layout. Subclasses should update any persistent model indexes after emitting layoutAboutToBeChanged(). See also layoutChanged() and changePersistentIndex(). This signal is emitted whenever the layout of items exposed by the model has changed; for example, when the model has been sorted. When this signal is received by a view, it should update the layout of items to reflect this change. When subclassing QAbstractItemModel or QAbstractProxyModel, ensure that you emit layoutAboutToBeChanged() before changing the order of items or altering the structure of the data you expose to views, and emit layoutChanged() after changing the layout. Subclasses should update any persistent model indexes before emitting layoutChanged(). See also layoutAboutToBeChanged(), dataChanged(), headerDataChanged(), reset(), and changePersistentIndex(). Returns a list of indexes for the items in the column of the start index where the data stored under the given role matches the specified value. The way the search is performed is defined by the flags given. The list that is returned may be empty. The search starts from the start index, and continues until the number of matching data items equals hits, the search reaches the last row, or the search reaches start again, depending on whether MatchWrap is specified in flags. If you want to search for all matching items, use hits = -1. By default, this function will perform a wrapping, string-based comparison on all items, searching for items that begin with the search term specified by value. Note: The default implementation of this function only searches columns, This function can be reimplemented to include other search behavior. Returns an object that contains serialized items of data corresponding to the list of indexes specified. The formats used to describe the encoded data is obtained from the mimeTypes() function. If the list of indexes is empty, or there are no supported MIME types, 0 is returned rather than a serialized empty list. See also mimeTypes() and dropMimeData(). Returns a list of MIME types that can be used to describe a list of model indexes. This signal is emitted when reset() is called, before the model's internal state (e.g. persistent model indexes) has been invalidated. See also reset() and modelReset(). This signal is emitted when reset() is called, after the model's internal state (e.g. persistent model indexes) has been invalidated. See also reset() and modelAboutToBeReset(). Returns the parent of the model item with the given index, or QModelIndex() if it has no parent. A common convention used in models that expose tree data structures is that only items in the first column have children. For that case, when reimplementing this function in a subclass the column of the returned QModelIndex would be 0. Note: When reimplementing this function in a subclass, be careful to avoid calling QModelIndex member functions, such as QModelIndex::parent(), since indexes belonging to your model will simply call your implementation, leading to infinite recursion. Returns the list of indexes stored as persistent indexes in the model. Removes the given column from the child items of the parent specified. Returns true if the column is removed; otherwise returns false. See also removeColumns(), removeRow(), and insertColumn(). On models that support this, removes count columns starting with the given column under parent parent from the model. Returns true if the columns were successfully removed; otherwise returns false. If you implement your own model, you can reimplement this function if you want to support removing. Alternatively, you can provide you own API for altering the data. See also removeColumn(), removeRows(), insertColumns(), beginRemoveColumns(), and endRemoveColumns(). Removes the given row from the child items of the parent specified. Returns true if the row is removed; otherwise returns false. The removeRow() is a convenience function that calls removeRows(). The QAbstractItemModel implementation of removeRows does nothing. See also removeRows(), removeColumn(), and insertRow(). On models that support this, removes count rows starting with the given row under parent parent from the model. Returns true if the rows were successfully removed; otherwise returns false. See also removeRow(), removeColumns(), insertColumns(), beginRemoveRows(), and endRemoveRows(). Resets the model to its original state in any attached views. When a model is reset it means that any previous data reported from the model is now invalid and has to be queried for again. When a model radically changes its data it can sometimes be easier to just call this function rather than emit dataChanged() to inform other components when the underlying data source, or its structure, has changed. See also modelAboutToBeReset() and modelReset(). Called to let the model know that it should discard whatever it has cached. Typically used for row editing. Returns the number of rows under the given parent. When the parent is valid it means that rowCount is returning the number of children of parent. Tip: When implementing a table based model, rowCount() should return 0 when the parent is valid. This signal is emitted just before rows are inserted into the model. The new items will be positioned between start and end inclusive, under the given parent item. See also insertRows() and beginInsertRows(). This signal is emitted just before rows are removed from the model. The items that will be removed are those between start and end inclusive, under the given parent item. See also removeRows() and beginRemoveRows(). This signal is emitted after rows have been inserted into the model. The new items are those between start and end inclusive, under the given parent item. This signal is emitted after rows have been removed from the model. The removed items are those between start and end inclusive, under the given parent item. Sets the role data for the item at index to value. Returns true if successful; otherwise returns false. The dataChanged() signal should be emitted if the data was successfully set. The base class implementation returns false. This function and data() must be reimplemented for editable models. Note that the dataChanged() signal must be emitted explicitly when reimplementing this function. See also Qt::ItemDataRole, data(), and itemData(). Sets the data for the given role and section in the header with the specified orientation to the value supplied. Returns true if the header's data was updated; otherwise returns false. Note that the headerDataChanged() signal must be emitted explicitly when reimplementing this function. See also Qt::ItemDataRole and headerData(). For every Qt::ItemDataRole in roles, sets the role data for the item at index to the associated value in roles. Returns true if successful; otherwise returns false. See also setData(), data(), and itemData(). Sets the supported drag actions for the items in the model. See also supportedDragActions() and Using Drag and Drop with Item Views. Returns the sibling at row and column for the item at index, or an invalid QModelIndex if there is no sibling at that location. sibling() is just a convenience function that finds the item's parent, and uses it to retrieve the index of the child item in the specified row and column. See also index(), QModelIndex::row(), and QModelIndex::column(). Sorts the model by column in the given order. The base class implementation does nothing. Returns the row and column span of the item represented by index. Note: span is not used currently, but will be in the future. Called to let the model know that it should submit whatever it has cached to the permanent storage. Typically used for row editing. Returns false on error, otherwise true. Returns the actions supported by the data in this model. The default implementation returns supportedDropActions() unless specific values have been set with setSupportedDragActions(). supportedDragActions() is used by QAbstractItemView::startDrag() as the default values when a drag occurs. See also setSupportedDragActions(), Qt::DropActions, and Using Drag and Drop with Item Views. Returns the drop actions supported by this model. The default implementation returns Qt::CopyAction. Reimplement this function if you wish to support additional actions. Note that you must also reimplement the dropMimeData() function to handle the additional operations. See also dropMimeData(), Qt::DropActions, and Using Drag and Drop with Item Views.